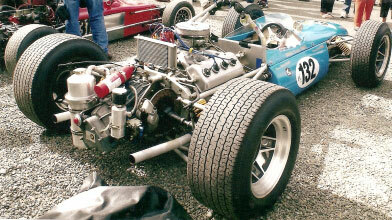 Historic racing car built in New Zealand. Fourth car built by George Begg. Currently running V8 Daimler 2500cc. Could run 4700cc (283 cu in) Chev V8 as was fitted with this engine for the first 6 months. – Brabham BT7A nose cone. Was invited in Dec 2006 to race at Eastern Creek, Australia, in Tasman Revival meeting. Could, possibley be accepted at Goodwood.